They feel like discipline is the key to why they struggle with their weight. Although discipline is a factor, it’s just one piece of the puzzle. 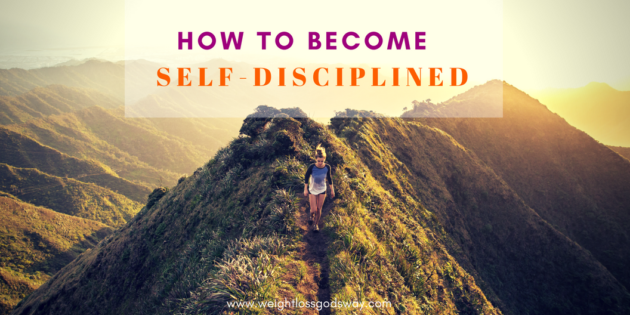 In this post, you will understand what self-discipline is and learn how to cultivate it in your life. I define self-discipline as the ability to persevere in a course of action in spite of how you feel. It’s the ability to consistently do something in spite of challenges or obstacles. It's a learned behavior. This means that you can learn self-discipline. It's not something that is only given to a select few. Its full benefit is only manifested through the power of the Holy Spirit. Although anyone can learn self-discipline, as Christians, it's full benefit is experienced as we seek God to help us develop this skill. It's not easy. Just as we talked about in the last post, developing self-discipline will take work and effort but the good news is that we are not left on our own to do it by ourselves. In fact, it's when we try to do it on our own that it's difficult, if not impossible. It is one of the fruits of the Spirit. Self-discipline is a fruit of the Spirit (self-control) and it's critical to master because without it we cannot bear any of the other fruits of the Spirit. Self-discipline is necessary in order to walk in love, joy, peace, patience, kindness, goodness, faithfulness and gentleness. It must be rooted in love. This point is my #1 strategy to help you master self-discipline. Like Tina Turner, you might be wondering, "What's love got to do with it?" (Sorry, I couldn't resist - LOL). My answer is "everything!" There are a lot of reasons why we are not disciplined. It may be because we're afraid of failure so we fail to take action. It could be because we lack self-esteem, we lack purpose and vision, or there are too many temptations around us. Given that these are the main reasons, the solution to all of these issues is to learn to love yourself and understand Christ's love for you. As we learn to love ourselves, and more importantly, learn to love who God created us to be, then self-discipline becomes less of an exercise in self-will and more of an act of praise and worship (Psalm 139:14). When we love ourselves, we’re inspired to be our best; we stop wasting time with frivolous things and we make the most of our time on earth; we focus on manifesting who we were created to be and stop dimming our light. When we love ourselves, we care for our body, nourish it and treat it like the gift that it truly is. LOVE MOTIVATES, LOVE INSPIRES, LOVE CARES, AND LOVE BRINGS OUT OUR BEST! So, how do you love yourself? That's a question only you can answer. It will differ for everyone based on how you're not currently taking care of yourself. Take some time today and make a list of things you can do to show love for yourself. The possibilities are endless. But know that the more you love yourself, the more you will discipline yourself to be all you were created to be. With practice, things that once felt overwhelming and impossible will start to feel easy. Why? Because you are living the life that God created you to live. When you live on purpose for God, you are naturally motivated and disciplined. So the question now becomes, "What will you do today to show yourself some love?" If you believe that love is the answer, share how you will be more loving to yourself below. P.S. Visit Weight Loss, God's Way to learn how to achieve your healthy weight. The problem with weight loss programs is that they're not sustainable. They all work in the beginning, then you hit a plateau, or even worse, gain more weight. You eventually get frustrated and give in to the temptations--reverting back to your old habits. Here's where I can help. After over 30 years in the health and wellness industry, I've learned how to help women get laser-focused on their goals so they can stop struggling and start getting results. I've created a simple, comprehensive program to help you get right to the root of why you do what you do. Test drive the first 10 days free and get some quick wins almost immediately. I will commit to do yoga and go to bed on time. I will forgive myself and get more sleep and let go of things I feel obligated to do. Today I will spend more time outside and be focused on God’s creation and all his many blessings. Thank you God for always loving.